Welcome to City TM Services Ltd. We specialise in Traffic Management training for the construction industry. We are a family orientated business with our ethos firmly centred on quality and reliability. We have been training and assessing for a total of over 50 years and pride ourselves on our amount of repeat business. We can train or assess staff at your chosen location, or are happy to run any of our courses at our state of the art training facility located in Hertfordshire, 10 minutes from junction 20 of the M25, or junction 8 of the M1. 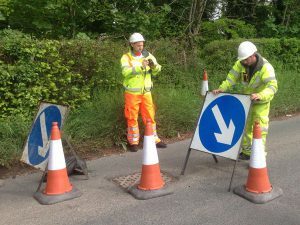 We are a registered training and assessment centre for Lantra Awards and can therefore offer you a complete service regarding sector scheme 12 A, B, C and D Traffic Management training. We run a national operation based from our head office in Hertfordshire, with regional operating centres in Kent, Berkshire and Yorkshire. All of our employees are directly employed by us, driving our own Chapter 8 specification vehicles. This means all quality of training and assessments is overseen on a daily basis from our head office VIA our Internet based server. This also means all instructors and assessors can access all current Q.A systems and assessment paperwork from anywhere in the UK. We are also currently the sole training provider for the new Lantra Awards approved Emergency Traffic Management course covering the installation, maintenance and removal of ETM on our strategic highway network. We offer a comprehensive package of CAD Drawings, Site Specific and Generic Method Statements and Risk Assessments, Safe Systems of Work and Consultancy for larger schemes. With over 75 years of combined experience to call on you can be assured of the very best attention to detail at all times. This website has been designed to be informative yet user friendly for our clients and future clients. Please feel free to browse all of our pages and come back any time to view regular news and updates.